Hyderabad: Two men involved in the sensational Nizam museum theft were caught by the Hyderabad police on Monday night and the stolen artefacts — a gold tiffin box inlaid with diamonds, a cup studded with rubies, diamonds and emeralds, a saucer and a spoon, belonging to the seventh Nizam — were recovered from them. The two arrested were identified as Mohd Ghouse Pasha alias Khooni Ghouse, 23, a centring worker in Rajendranagar and Mohd Mubeen, 24, a welding worker also from Rajendranagar, police said. According to the Police Commissioner of Hyderabad, Anjani Kumar, the duo recced the place 45 days prior to the date of offence so that they won’t get recorded in the CCTVs installed inside the premises as its memory is set to erase itself every 30 days. The two were childhood friends and distant relatives. They were also habitual property offenders. “They slipped in via the ventilator that they have marked 4 to 5 days before the offence. The whole plan was the brainchild of Mubeen, who went inside the museum about 45 days before as a visitor and noticed the poor security. He talked Ghouse into his plan and the duo hatched an elaborate, nearly perfect plan to steal the priceless artefacts” said the official, adding that they tied 30 knots on the 10-meter rope to get in and out with ease. While Mubeen held the rope back, Ghouse slipped in, broke the lock of the wardrobe and got out with the Nizam’s gifts. The only clues police had were the marks made around the ventilator by the men before the offence. They immediately changed their clothes and deliberately roamed in the vicinity to avert the cops, as a criminal would escape the place as early as possible. “They took onto the highway road on Muthangi towards Zaheerabad and slyly came back via a service road, to create an alibi in the CCTVs on highway that they left the city. They then went to Mumbai via bus with the stolen golden spoon as a sample to strike a deal in the international markets through their contacts there. When they could not get a good offer, they came back to the city and waited for an offer,” added Kumar. 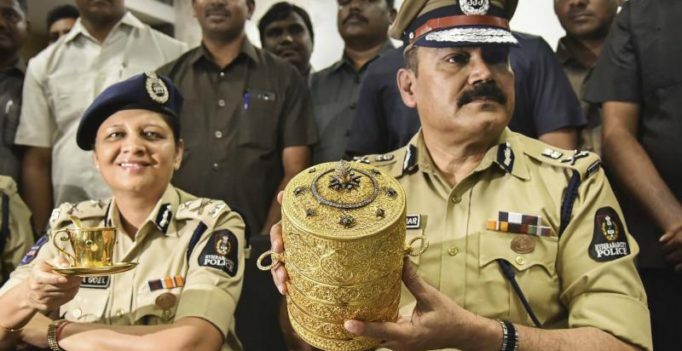 According to a report in NDTV, the three-tier tiffin box worth several crores may not have been used by the Nizam, but one of the thieves used it every day to have food, the Hyderabad police said. Another interesting point in the case, as confessed by the men, was that they had planned to decamp with a holy book in the museum as well, along with the actual stolen lot. “While they were at the museum at the time of offence and were about to take the holy book, they suddenly heard the evening prayer in the nearby mosque and feared the act of taking the book. They left only with the Tiffin box, cup saucer and spoon” said the official. Based on a tip-off following Mubeen’s missing report, the police cracked the case after rounding up the usual suspects and recovered the stolen lot.